Welcome to What We’re Playing Monday! XCOM is a roller coaster. It all starts out very fun, a little daunting, but once you get the hang of things, it seems like it will be a smooth ride. Then, things take a turn. The difficulty jumps up to a degree you didn’t anticipate and suddenly every alien turn is a stress-fest as you wipe your sweaty palms on your shirt while you pray to whatever deity you believe in for the aliens to miss their shot or FOR THE LOVE OF GOD, LEAVE MY HIGH-RANKING SNIPER ALONE, YOU BIG BULLIES! But then, with patience, careful movement of your soldiers and a hell of a lot of research and resources, things level off again. Suddenly, that sniper who struggled to finish off a Thin Man is double-tapping (attacking twice in a single turn) her way to victory, seemingly all by her lonesome. Your assault soldier’s useful shotgun is a now an Alloy Cannon of death and you almost feel bad for that Berserker that is about to get shot directly in his ugly face. Almost. This has been my XCOM experience. Hello, Sushians. I’ve come to give you very bad news: single player video games are nothing more than a gimmick. I know, this may come as a shock to you. What, with games like Dishonored, XCOM, Deus Ex, Skyrim and Batman: Arkham City gracing our screens over the last couple of years. I mean, it’s easy to be fooled by these great titles with fantastic mechanics or engrossing stories. But you really should know that playing by yourself is a gimmick. Antonson goes on to talk about how toddlers make up someone to talk to when they play games, and even points at the “high score list” in arcades as a way to make games social. I understand what he’s saying — on one level, playing a game in a social setting transforms the entire experience. It’s nice to compare experiences with other people in a meaningful way, as we’re seeing with a game like XCOM. But on the other hand, I think it’s too much of an overstatement to say that all single player titles are inherently gimmicky by not including a social component. So what do you guys think? Is this WTF worthy? Is Antonson off his rocker in his assessment of single player as a gimmick? Does every game need some kind of social component in order to truly matter? Go! Do you ever have one of those games show up on your radar so suddenly that it just kind of takes you back? Like, you’ve got all your priorities lined up, you know where your time is going to go for the next few weeks, and then out of nowhere, you get Falcon Punched by some game you hadn’t even paid attention to? That’s the case with me and XCOM: Enemy Unknown, the new turn-based, tactical role-playing military game from Firaxis. For some reason, I had no interest whatsoever in XCOM for the last year that I’ve been hearing about it. I really can’t tell you why. But then, people started raving about it just a week or two ago. Then they raved more. And harder. We’re talking glowsticks in the air like you just don’t care kind of raving, from all corners of the gaming press. You can’t help but take notice when that happens. Then I did that thing that we gamers do, when we get on the slippery slope and say that we’ll just read one review or watch just one video of something, just to get our feet a little wet. And then you discover that the game has all kinds of personalization, like naming your team and leveling them up. And you find out how fun the strategy combat looks. And about some of the cool abilities your team gets as the game rolls on. You know, the wonderful stuff games are made of. 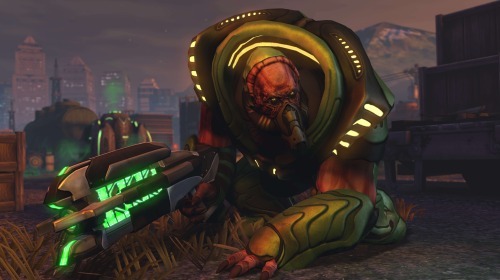 And now, dammit, I want to buy XCOM: Enemy Unknown. So now, a couple of questions: do you guys ever try to resist the temptation to learn about a new game that people are talking about? Who here is getting XCOM? And what is the deciding factor that gets you suddenly interested in a snap decision like this? Go! XCOM is one of the classics of the the PC gaming scene, an old-school strategy title where you waged war against alien invaders as the director of a Men In Black type organization. In the re-imagining of the series (done by Bioshock developers 2k Games), you still undertake the role of the leader, but instead of issuing orders from behind a desk, you step out into the field to meet the aliens mano a mano. A trailer dropped for the game during E3, and dang if it doesn’t look intense. Set during the 1950s, this game bares more than a passing resemblance to another period-piece title from 2K that I mentioned above. 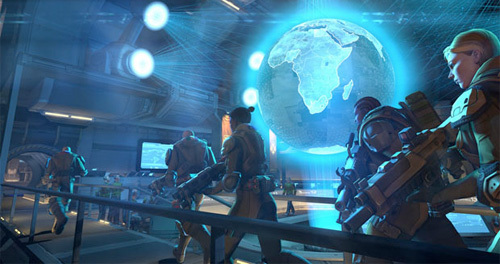 While similarities aren’t exactly a bad thing, especially given the fact that this is probably the best team to turn XCOM into an FPS, it still remains to be seen whether this will help or hinder the game come release time. What do you guys think about XCOM? Eager to blast some symbiote-looking aliens, or upset about the change in genre?